Note: To keep up to date on the latest news from Rise Women’s Legal Centre, please follow their website here or their Clicklaw HelpMap service listing. Services are subject to change. After over a decade of research, work, and planning, Rise Women’s Legal Centre has officially opened its doors to the public. Rise welcomes all self-identified women who are experiencing family law issues, and who: cannot afford legal counsel, may not qualify for legal aid, or whose legal aid hours have run out. Rise is Vancouver-based but accepts calls from clients throughout BC*. As a legal centre, Rise offers a multitude of services for women facing family law issues. use our library and computer at our Self-Help Centre to do your own research in a safe space. As law students, student advisors cannot appear in Supreme Court, which means we cannot represent you in proceedings at the Supreme Court level. However, we may still be able to help with other steps along the way, such as preparing court forms and documents, and preparation for hearings. Although our services are restricted to the legal realm, if you seek support in other areas such as counselling, job search, housing, to name a few, we can connect you with right resources. Presently, Rise will only handle family law issues but will be expanding its services in the future to include other areas of the law. Rise has been formed through a partnership between West Coast LEAF and the Peter A. Allard School of Law at UBC, and with the support of private donors. 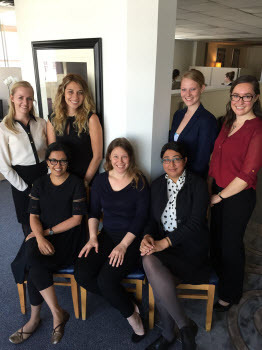 Our clinic is staffed by: a dedicated group of senior year law students from Allard Law, our knowledgeable and experienced supervising lawyers, and our wonderful office manager. We recognize the serious gap in funding for family law disputes, which has resulted in the growing population of self-represented litigants in these cases. Self-representation can sometimes lead to very negative outcomes and the overall experience can be scary, isolating, and generally unpleasant. We are here to help. Student advisors are in their final year of law school, and working at Rise adds an experiential learning component to these students’ academic careers. Aside from completing the Family Law course at the law school, all students have also undergone a two-week orientation and training program led by experienced family law lawyers, advocates, and professionals within the legal community. Additionally, students will be researching and preparing a seminar paper on a chosen topic in relation to the work done at the Centre. As one of the student advisors here at Rise, I have enjoyed my time so far and am looking forward to the busy summer ahead! *Rise is able to conduct some interviews over the phone for remote clients to give summary advice. However, for full services (going to trial in Provincial Court as counsel), we may be restricted to courts in the Lower Mainland. For example, in one instance where a client from Kelowna needed help with trial preparation (for her Kelowna court appearance) my colleague was able to provide her unbundled services by giving her advice over the phone and email, but leaving court appearances to the client herself. To connect with us, please give us a call at 604-451-7447 or email us at info@womenslegalcentre.ca. As the inaugural class at Rise, we are honoured to be the first to partake in this amazing project. We look forward to using our legal skills and knowledge to do work that is meaningful and purpose-driven, and we are excited to welcome you to our Centre!